The FDCI (Fashion Design Council of India) along with the Department of Industrial Policy and Promotion and the Ministry of Commerce and Industry collaborated and brought forth ‘Weaves of Banaras’ that was a breathtaking display of the magnificence that lies in Banarasi textiles. 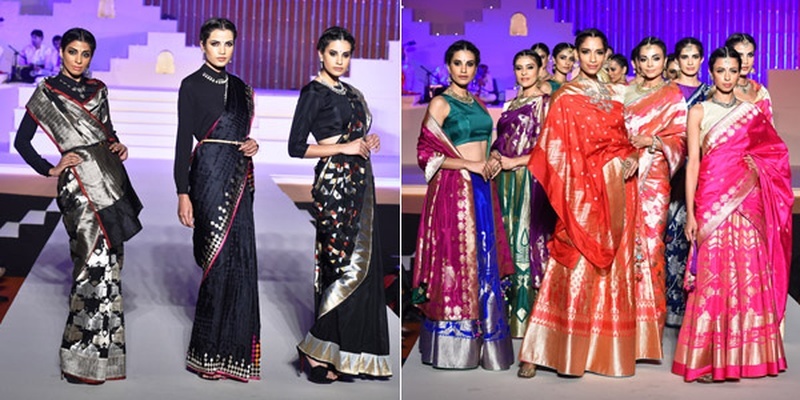 Held on the 14th of February at ITC Grand Central, Mumbai, Weaves of Banaras showcased the brainchild of A-list designers from the fashion industry - Sabyasachi, Rohit Bal, Anju Modi, JJ Walia, Rajesh Pratap Singh, to name a few. Diverse styles of weaves that translated themselves onto stunning sarees, gorgeous lehengas and sherwanis and kurtas as well. Scroll down to see the brilliance of ethnic India showcased through this beautiful collection.